Nassim Taleb calls it "One of the most important management books of all time." 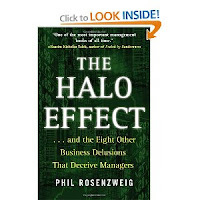 The Halo Effect tells us why much of what we believe about business is quite likely false, thanks to a number of delusions. Author Phil Rosenzweig doesn't mince words as he attacks a number of the most popular business books of all time for failing to account for simple and foreseeable errors in drawing their conclusions. The business books that were spawned following the successes of the original best-sellers lead its readers to believe that business success is just a few formulas away. By following a set of policies (as employed, of course, by the "winners"), success is all but assured...right? Unfortunately, this line of thinking falls prey to what Rosenzweig calls the delusion of absolute performance. That is, there is an assumption that there isn't a competitor out there that is also improving itself. As an example, Rosenzweig discusses K-mart in its last few years before bankruptcy. The company installed POS terminals (providing better information on sales), expanded central buying thereby reducing procurement costs, modernized inventory management, reduced expenses as a percentage of sales, and improved its inventory turns tremendously. But at the same time, Wal-Mart was doing all of these things better. Of course, most authors would turn the story of K-mart's demise into a "Halo Effect"-like narrative about poor morale and its effect on performance, further hurting morale. But K-mart actually improved its situation, but sometimes that's just not enough.